The Aerospace Supply Chain and Cyber Security - Challenges Ahead looks at the current state of commercial aviation and cyber security, how information technology and its attractiveness to cyber attacks is affecting it, and the way supply chains have become a vital part of the industry's cyber-security strategy. More than ever before, commercial aviation relies on information and communications technology. Some examples of this include the use of e-tickets by passengers, electronic flight bags by pilots, wireless web access in flight, not to mention the thousands of sensors throughout the aircraft constantly gathering and sharing data with the crew on the ground. The same way technology opens the doors for speed, efficiency and convenience, it also offers the unintended opportunity for malicious cyber attacks, with threat agents becoming bolder and choosing any possible apertures to breach security. Supply chains are now being seriously targeted as a pathway to the vital core of organizations around the world. 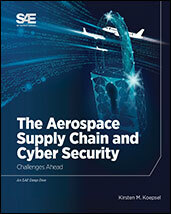 Written in a direct and informative way, The Aerospace Supply Chain and Cyber Security - Challenges Ahead discusses the importance of deeply mapping one's supply chain to identify risky suppliers or potential disruptions, developing supplier monitoring programs to identify critical suppliers, and identifying alternative sources for IT/ICT products or components, to name a few of the necessary actions to be taken by the industry. The Aerospace Supply Chain and Cyber Security - Challenges Ahead also discusses the standardization of communications platforms and its pitfalls, the invisible costs associated with cyber attacks, how to identify vulnerabilities of the supply chain, and what future scenarios are likely to play out in this arena. For those interested in the many aspects of cyber security, The Aerospace Supply Chain and Cyber Security - Challenges Ahead is a must-read. If you do not have access to SAE MOBILUS via username/password or institutional access, you can still purchase the Book, The Aerospace Supply Chain and Cyber Security - Challenges Ahead.